Instead of posting our news as separate threads every day, I'll be posting a daily update into this thread. This will keep all our posts in one place for you to check and react with every day. Thanks a lot for the reads and comments so far, I love posting here. Fed Turns Bear, Gold Soars - But US Shares? Yesterday we discussed how company buybacks are propping up a US sharemarket that should be falling on poor and reducing earnings. Last night typified this market based on free money not fundamentals. The US Fed announced ‘no rate hike’ but also turned decidedly dovish in its forecast amid a weakening global outlook. 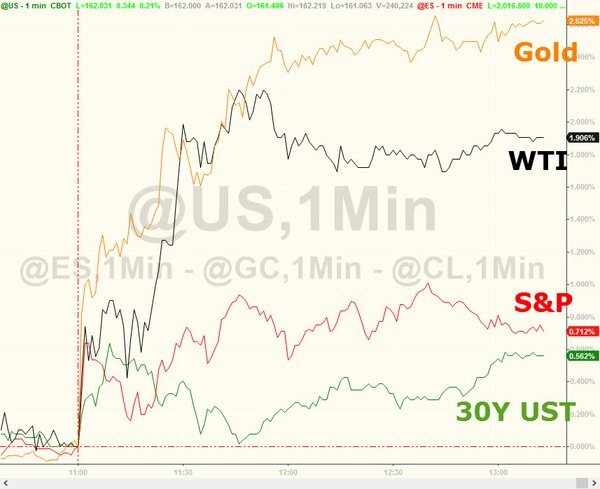 So of course gold surged more than any other asset class last night on the news (see the chart below), up over 2.6% (in USD)... BUT shares too rallied, up 0.7%? This is yet another example of bad news being good news for shares. Fundamentals are bad, but that means more free money and debt fuelled buying so up go shares. This is not a new thing since the GFC. But what we’ve seen more of in 2016 is a market starting to realise that this is a giant Ponzi scheme and that maybe these central bankers don’t really have control, hence yesterday’s article on the exodus of ‘real’ investors, replaced by company buy backs. So last night’s rally could soon see the penny dropping sell off. These daily gyrations are all what you might call ‘micro’ moves. Tomorrow we will share with you something a little more ‘macro’ that could portend a big move being imminent. What I wonder about is whether this new "dovishness" by the fed will incite another S&P buying spree by institutional investors and Joe Public, who have been "out" or reducing their exposure to stocks for a while now. Will there be a return to the risk-on behavior of the past 6 years? I'm glad you think not, but I am skeptical until we break some recent lows. Thanks for posting these articles. Keep up the good work. “You’ll see that this only generated two signals in the last 10 years. If you sold stocks at the bearish signal in 2008 [when the lines crossed], you avoided a 43% drop. If you bought stocks at the bullish signal in 2010, you made 68% in a huge multiyear rally. Today we’re closing in on a bearish signal. You can see the two lines coming together quickly. 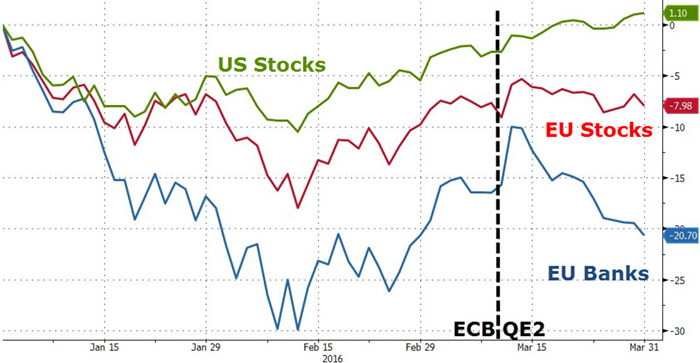 Unless stocks have a dramatic surge, they’ll cross. This would generate the first bearish signal since 2008. So this is the 3rd article this week on the US sharemarket you say? The old saying of when the US sneezes Australia catches the cold has always held. When (not if) this crash comes, down we go too. “Interest rates in the United States have fallen to minus 2pc in real terms and are dropping into deeper negative territory with each passing month. This is a remarkable state of affairs. It is clear that the US Federal Reserve is now trapped. The FOMC [Fed committee] dares not tighten despite core inflation reaching 2.3pc because it is so worried about tantrums in financial markets and about that other Sword of Damocles - some $11 trillion of offshore debt denominated in dollars, up from $2 trillion in 2000. The Fed has been forced by circumstances to act as the world's central bank, nursing a fragile and treacherous financial system struggling with unprecedented leverage. The problem with this procrastination/meddling is that it exacerbates the problem when finally addressed (too late). The last example we saw of this before the GFC was when the Fed’s Greenspan slashed rates after the Asian Crisis but held them low too long… enter the dotcom bubble. There is a double benefit for gold in these circumstances. Gold historically loves negative real interest rates (interest rates less inflation). The US is there as mentioned above and some countries (Eurozone, Japan, Switzerland etc) actually have negative interest rates - NIRP (even before inflation adjustment). Australia is about nil. Since introducing that policy Japan has sold out of safes as people are hoarding cash. Inflation still erodes cash value whereas gold usually protects against inflation. All that printed money since the GFC could well see a sudden surge in inflation if we actually see the velocity of money respond at last. 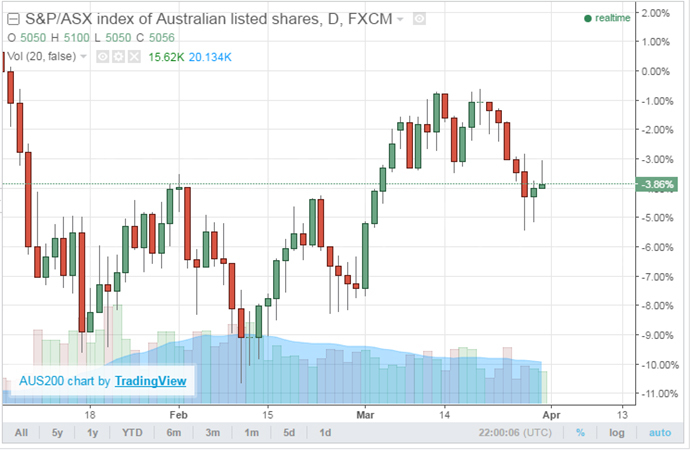 Not many analysts predicted an AUD at 76c around now. A combination of better than expected (but questionable) domestic economic data and the rest of the world sinking into zero or negative rates makes our still yielding dollar look comparatively good. 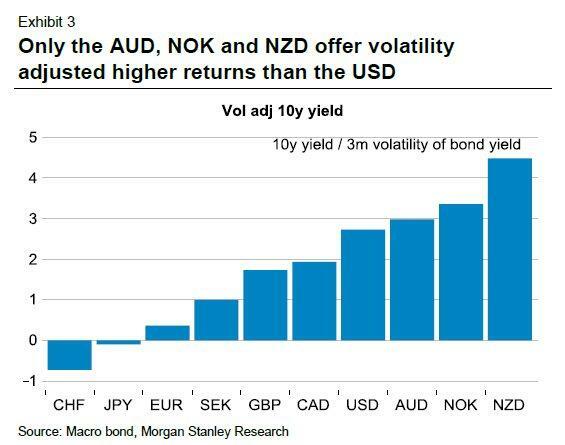 Indeed if you check out the chart below (courtesy of Morgan Stanley Research) only the NOK (Norwegian Krone) and the NZD offer a better return (after volatility adjustments) than the AUD, and all 3 higher than the ‘mighty’ USD. It’s this carry appeal that sees a flight to the AUD and hence a stubbornly high rate in the face of our post mining boom economy. But the BIG question is ‘for how long?’. Well when the world’s biggest (by far) asset manager is in the press yesterday calling a “mid- to-low 60c level” AUD by year’s end it is certainly worth noting. BlackRock have an incredible US$4.6 trillion of assets under management. For perspective, our biggest bank, CBA is a fifth the size with AU$0.87 trillion. One thing is certain, our RBA and exporters do not like a circa 76c AUD and there will likely be moves to get it down. The median forecast amongst analysts is 70c by the end of 2016, 8% lower than now but much higher than BlackRock’s call. BlackRock think the RBA will be handed the excuse (need) to cut rates via poor GDP growth for the rest of the year, predicting 2% as opposed to the 3% we saw last year, which they say "will open the door for rate cuts and, if it opens the door for rate cuts, that opens the door for a lower Aussie dollar," …… "Over time, albeit in a fairly volatile fashion, we'll still get to the mid- to-low 60c level by the end of this year." Gold and silver provide an easy currency play. A move from the current 75.85c to even their high range 65c would see the current price of gold and silver rise nearly 17% to $1915 or $24.40 without any change in the USD spot price. Again we awake and ask ‘what a world we live in?’. That goes of course for our financial markets too. Let’s step through last night’s market action through the eyes of the world’s biggest sharemarket index the US’s S&P500 (courtesy of ZeroHedge). We are so conditioned to terrorism that any immediate reaction is ordinarily bought as a dip opportunity (buy the dip). But what was interesting then is what the market did after US Fed president Charles Evans spoke. What did he say? Well fresh after the very Dovish meeting outcome last week, he went about jawboning the market that everything is fine…. 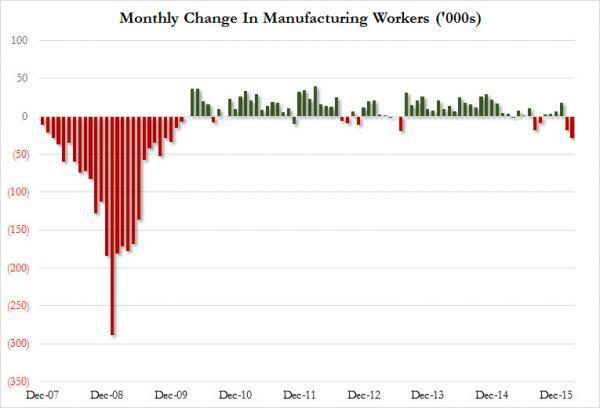 “we expect 2016 growth will be 2 to 2.5% and I think the fundamentals are really quite good for the economy going forward.”… Hmmmm, so the market reacts to this by rallying? Oh no… as you can see above the market sells off. This can mean a couple of things. Firstly it’s the opposite of the usual ‘bad news is good news’ reaction in that if the Fed thinks things really are getting better then they may raise rates soon. That’s not great for the free money game so let’s get out of dodge now. Secondly it could be that yet again we have a market that is seeing straight through this central bank rubbish and is selling on the basis that for them to be coming out with this sort of announcement in the face of reality means they are getting quite desperate. So let’s see what “really quite good” looks like and then ask yourself how sustainable that green up arrow looks…. Ainslie Bullion will deliver your purchase free of charge to Reserve Vault for you to put in your own safe there. When you want to sell, you simply call us to pre arrange, locking in a price if you wish, attend to your safe and hand your metal to the staff at Reserve Vault. We will then deposit the funds to your account or you can come to our nearby store and collect cash. Simple. Anyone loading a gold spot chart this morning would have had their attention grabbed by the near 2% pop overnight. The catalyst was Janet Yellen’s dovish presentation on U.S. monetary policy at the Economic Club of New York overnight. Australian markets set for 33 point gain at open. Despite falling short of specifically mentioning negative interest rates, Yellen confirmed that the Fed would introduce more bond purchases and swaps should the circumstances require such actions. Yellen then continued to acknowledge that economic conditions are currently somewhat more arduous than what seemed apparent to her only months ago and cited, as usual, global economic concerns as bottlenecks. Yellen referenced “considerable scope to provide additional accommodation” making reference to the ability to cut the federal funds rate to near zero in the face of “stubbornly low” inflation. Of particular interest to analysts was the statement “we could use the approaches that we and other central banks successfully employed in the wake of the financial crisis to put additional downward pressure on long-term interest rates and so support the economy; specifically, forward guidance about the future path of the federal funds rate and increases in the size or duration of our holdings of long-term securities”. Ken Ford of Warwick Valley Financial Advisors stated that the ongoing anaemic global growth as the keystone of the speech will be ultimately bullish for gold in the long term as central banks continue to struggle with their diminishing effectiveness and credibility. 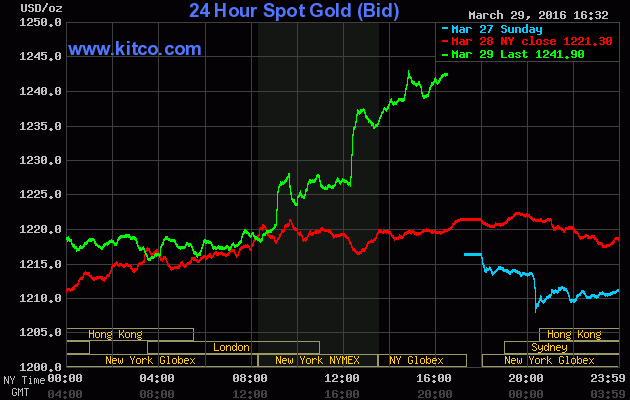 Gold prices are up in the vicinity of 17% year to date. In summary, the remarks give weight to established bearish predictions from many alternative media figures such as Euro Pacific Capital’s Peter Schiff who has for some time gone on record stating that the Fed’s next move is likely to be QE4 by another name. BlackRock has this week voiced concerns relating to the Federal Reserve’s desire for upside risk to inflation and the subsequent policies which are designed to create it. 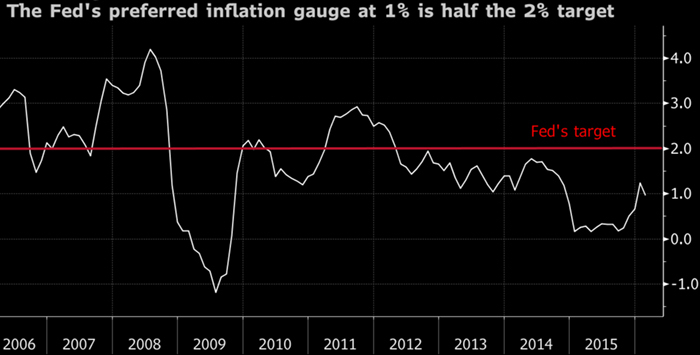 This desire is neatly summarised by Stanley Fischer’s (Fed Board of Governors vice chair) statement this month where he observed that “we may well at present be seeing the first stirrings of an increase in the inflation rate — something that we would like to happen”. Given this environment, BlackRock chief investment strategist Richard Turnill expressed his interest in inflation hedge instruments such as gold and inflation-linked bonds in a statement released this week. Mr. Turnill specifically cited oil prices and labour market conditions as possible contributors to inflation above and beyond the policy of the Federal Reserve. The statement follows existing recommendations from PIMCO (Pacific Investment Management Co.), which has for approximately three years offered a “Multi Real Asset Strategy” product; something introduced with the dedicated objective of addressing inflation risk. The Multi R[fitimg][/fitimg]eal Asset Strategy contains exposure to multiple inflation-sensitive real asset classes including real estate and gold. PIMCO’s Joachim Fels stated in a Bloomberg interview that they “still think markets are pricing in too low a profile for inflation”. One of the metrics used to determine this is the difference between Treasury Inflation Protected Securities and 10 year note yields. The discrepancy tends to signify market anticipation for consumer prices. In a video on the company’s website earlier in March, Chief Investment Officer Real Return and Asset Allocation at PIMCO, Mihir Worah suggested that inflation is likely to be significantly higher than the 1% that the market is currently pricing in. Today marks not only the end of the week but the completion of the first quarter of the year so it is a timely opportunity to take a look at the performance of gold year to date in what has been a turbulent and volatile period of time. In today’s weekly wrap, we comment on gold’s stellar performance this year and place it in the context of a strained equity market and inflated property landscape. In what turns out to be the year’s best performing major commodity, gold saw increases in excess of 16% in Q1 which is the best start to a year since 1974 and the best quarter since Q3 1986. For perspective, those years saw Gough Whitlam and Bob Hawke as Prime Minister respectively. Although fading somewhat in the aftermath, gold’s appeal was boosted in response to Janet Yellen’s dovish presentation on U.S. monetary policy at the Economic Club of New York on Tuesday night where expectations of ongoing rate rises were quelled. Readers interested in more details on this event are welcome to read our Wednesday news article. Gold typically performs well in environments of extended low interest rates as yield in alternative investments is suppressed. The precious metal has also seen benefit from what are now lingering concerns of global risk; recent examples of which include the Brussels attack on the 22nd of March (gold rose over 1% in response to that event alone) and concern over the consequences of a “Brexit” (a U.K. exit from the European Union). Apprehension around the notion that central banks are deficient in their capability to manage another GFC style event has also featured strongly in the media during the last quarter. Macquarie Group precious metals analyst Matthew Turner stated earlier this month that “gold does well when central bankers appear to be losing control”. One example of this was the Bank of Japan surprising markets with their transition to negative interest rates in late January. That event saw an increase in the use of the term “currency wars” which is a concept often discussed by lawyer, financial commentator and author Jim Rickards. For a comparison of investment performance year to date, Australian stock market index investors have seen falls close to 4% as pictured below and although this is disappointing given the fact that the US markets have managed to achieve a 1% gain for the year, it compares favourably with the situation in Europe and especially in the European banking sector which have seen falls of approximately 8% and 21% respectively. In the latter case, these falls have been seen in the context of the ECB announcement earlier this month regarding the cutting of their main interest rates and the expansion of their massive bond-purchase program. A Wall Street Journal article published overnight perhaps best summarises the safe haven zeitgeist surrounding gold at the moment by quoting RBC Wealth Management managing director George Gero: “People are reluctant to take profits on their gold positions because of all the insecurity the world is facing”. The number of multiple job holders jumped by 127,000 as people need more of the predominately new low paying jobs to make ends meet. The core sector of employed men aged 35-54 dropped by 76,000. We have been frequent reporters on Russia’s national acquisition of physical gold; something that was engaged in with particular vehemence in the latter part of last year. In 2014, Russia was forced to draw down on its reserves, utilising around 20% in support of the Ruble at that time. We noted late last year that such actions are often due to a multitude of factors including sanctions, currency devaluation and falling oil prices and we reiterate that Russia’s gold acquisition is contrary to what we typically expect to see in the case of foreign reserve drawdowns – which is a tendency to halt acquisition or even liquidate gold reserves. This year on the other hand has seen an approximate 9 percent rally in the Russian currency which has given support to the idea that the country would again start foreign currency purchases after a hiatus of approximately three quarters. It appears that Central Bank of Russia head Elvira Nabiullina is in no rush to do so however. Gold’s recent stellar performance which we reported on last week has bolstered Russia’s reserves to a level now exceeding $380 billion. This gives the nation some flexibility to delay foreign currency purchases in their pursuit of a $500 billion reserve target. According to a recent survey of economists, Nabiullina is likely to wait for something in the vicinity of a 12% increase in the Ruble which would mean a 60 to the dollar level (it is currently just under 69) prior to the resumption of foreign-exchange market involvement. The period of time since efforts to restock reserves were halted has seen an incredible 7 percent increase in total Russian holdings; something that has been largely achieved simply by the appreciation of its gold purchases which themselves have increased 12 percent in that time. The following chart illustrates this scenario. An important takeaway here is that the flexibility and diversity that physical gold has provided Russia is directly applicable at the individual level. This week has seen a deluge of local financial news which continued overnight. Following the ABC’s Monday night 7:30 Report segment on questionable lending practices, yesterday articles appeared regarding what ASIC is calling “unconscionable conduct” at Westpac; news that all but drowned out the RBA’s announcement to leave rates at 2% for the 11th consecutive month. This morning we briefly summarise the news to date, the reaction in the media and emphasise what this may mean for local depositors and investors. Readers may recall ASIC’s accusations against ANZ regarding BBSW (bank bill swap rate) fixing last month. Yesterday, similar action was taken against Westpac in what may be determined as a breach of the Corporations Act. It is claimed that over a period of two years, Westpac employees acted in a manner that produced artificial rate environments beneficial to the bank on 16 occasions. The scenario draws close parallels to the LIBOR (London interbank offered rate) scandal which embroiled banks such as Royal Bank of Scotland and UBS and had some impact in Australia also. In simple terms, the allegations suggest that the particular events in question saw Westpac with numerous products which derived their value from the BBSW and that it conducted trading activity in the bank bill market with the objective of impacting pricing in a manner favourable to the bank. Opinion is broad and confronting regarding ASIC’s actions and a spectrum of comments can be seen in the news as a consequence. Sarah Danckert and Clancy Yeates, both business reporters at the SMH and The Age described ASIC’s move as having “again shone a light on the toxic culture of trading floors in Australia”. In contrast, Financial System Inquiry chair and former Commonwealth Bank chief David Murray has gone as far as saying “Adolf Hitler comes to mind” when attempting to articulate what he sees as ASIC’s overreached attempts to regulate culture and subsequently pursue “liability for a culture breach”. As mentioned above, news surrounding the mortgage related risks in our banking sector which we discussed immediately following the Easter break has continued this week with APRA chairman Wayne Byres admitting that some bank lending aspects are now “eerily similar” to those observed at the time of the GFC. These recent developments have seen banking stocks drag the Australian equity markets to the lowest levels in a month. Perhaps as a result of the Australian government deposit guarantee scheme, it would be reasonable to say that many Australians in general view the local banks as stable entities and as such, vehicles that can be entrusted with savings and investments. Determination of risk tolerance is a personal choice; however in environments such as these it is prudent to consider the suggestions of those such as American market trader and commentator Gregory Mannarino. One of Mr. Mannarino’s suggestive catch phrases is “become your own central bank”, alluding to the ability to acquire personal reserves comprising of physical and ideally liquid and divisible assets. There is a more buoyant mood around the Australian economy at the moment off the back of more stimulus fuelled growth and ‘stability’ out of China, domestic economic growth and more solid employment numbers of late. However most of this is courtesy of more debt, at a time when the debt burden is starting to show in the global economy. So when we say courtesy of more debt, what do we mean? Well, consider that our GDP is growing by about 3% but to achieve that growth we, the private sector of Australia grew our debt by 6.6% over the last year. To quantify that 6.6%, it is about $165b on top of the already gargantuan $2.5 trillion base – in one year! Aussie GDP is about $2 trillion. Primary school math will tell you that doesn’t add up. As we’ve mentioned before, Australia has the unenviable title of the highest personal debt to GDP rate in the world. It’s a bit like watching high flying entrepreneurs living the high life and making ‘rich lists’ with growing ‘wealth’ when behind the façade is debt in excess of this (often just paper) ‘wealth’ before they inevitably fall in a heap, leaving a trail of devastated creditors behind. The fact is, you can’t continue to collectively borrow more than you collectively earn. As we mentioned yesterday, you know when APRA chairman Wayne Byres admits that some bank lending aspects are now “eerily similar” to those observed at the time of the GFC things are getting a bit closer still. Aussie housing makes up $1.5t of that $2.5t private debt total. That we are now starting to see real evidence of the property boom ending and the simply epic apartments supply/demand/settlement default setup starting to unwind adds to the potential immediacy. Jim Rickards, who we’ve written about previously has this week launched his latest book entitled “The new case for gold”. In the last week or so he has been participating in numerous interviews promoting the content and has provided some succinct and factual rebuttals to many of the anti-gold ideas and comments that are commonly heard. According to Jim, it is little wonder that those who value the role that precious metals play in a sound and balanced investment strategy are largely misunderstood. This stems from the fact that there are now “upwards of three generations who have been miseducated, uneducated or led in a false direction with regards to gold”. Since the mid-1970s gold has essentially not be taught in universities and financial courses. Jim’s economics class of 1974 was one the last classes to be taught gold as a monetary asset. Beyond that, Jim claims that anyone younger than him with any real knowledge of gold “is either self-taught or has attended mining college”. One of the first main-stream inaccuracies that Jim dispels is the claim that gold is a rock; usually accompanied by some form of dissuading adjective. It is a metal. Quite interestingly too, it is a metal that the US has 70% of its reserves stored in. This is impressive for something that Ben Bernake claims is held for reasons of “tradition”. Secondly, Jim addresses the argument that gold cannot be used as a financial base because the gold supply does not expand quickly enough to support the growth of the world economy. It is commonly claimed that with mining output relative to global gold stock at about 1.6% a year – and given world growth varies say between 3% and 4% a year, then the adoption of gold as a monetary base would be deflationary “given that gold can’t keep up”. Jim argues simply that the numbers are accurate but irrelevant “because mining output has nothing to do with the ability of central banks to expand their gold supply and participate in discretionary monetary policy”. The argument compares apples and oranges by confusing mining output with total gold. “With approximately 180,000 tons above ground but only 35,000 tons held by central banks, there is ample scope for banks to simply buy privately held gold” and effectively acquire more in an open market operation. Thirdly, Jim addresses the claim that there is not enough gold to support world trade and commerce by stating “that’s another nonsensical comment”. His assertion is that “there is always enough gold, it is just a question of price”. At $1250 per ounce, a gold standard is not a good idea as it would lead to a deflationary environment. At something more like $10,000 per ounce for example, conditions would actually be mildly inflationary (depending on the definition of the currency base being utilised). Jim emphasises that the consideration is never about the gold supply as such but rather about the price of that supply. Lastly, Jim discusses the argument that gold has no yield; one of the most frequent anti-gold comments in current circulation. In rebuttal, two answers are made. Firstly, in a negative yield environment, zero-yield is the high yield asset. The other answer applies in a positive yield environment too; that is that gold is money and as such it is not intended to have yield. As an example, Jim invites readers to consider taking a $20 bill from their wallet or purse and holding it up in front of them. Propose the question “what is the yield on that bill”? The answer is zero. It is only when that bill is deposited into a bank that it might offer yield but by doing so it is not money anymore; it is an unsecured bank deposit (liability). Jim emphasises that this is another “apples and oranges” comparison. In a closing thought, Jim highlights the fact that owning stocks, bonds and other classical electronic forms of investment is nothing more than “owning electrons”, warning that “digital wealth can be erased”. As an example, Jim highlights the recent case where Bangladesh had $100M on deposit with the Federal Reserve NY which “disappeared” and “if that wealth was in physical gold, they’d still have their $100M”. Almost exactly one year ago, we wrote about the interest that Rajesh Exports of India showed in acquiring gold mining assets here in Australia. In a similarly motivated move and despite Q1’s impressive performance, China is now taking advantage of generally low gold prices to search for distressed mining operations abroad with the intention of acquiring them cheaply and reducing their reliance on international stake holders. To date, Zijin Mining is one of only a very few China based companies that have actually acquired foreign mining assets and that looks set to change. In support of this, Sprott Asset Management CEO Peter Grosskopf was recently quoted as saying “China has five-to-six gold companies. I have been in touch with all of them and they all have plans for increasing assets overseas”. Mr. Grosskopf continued to say that “most of the Chinese companies are looking at existing gold deposits and companies, rather than building mines from scratch”. Chen He, Investment Director at Zhaojin Mining Industry Co. Ltd has indicated that “Zhaojin is looking for global opportunities” confirming that “it is a good time right now as the gold price is in the lower regions”. In Zhaojin’s case, possibilities range from acquiring company stock or purchasing projects directly. Potential markets include developed regions such as Canada and Australia in addition to developing markets such as South America. 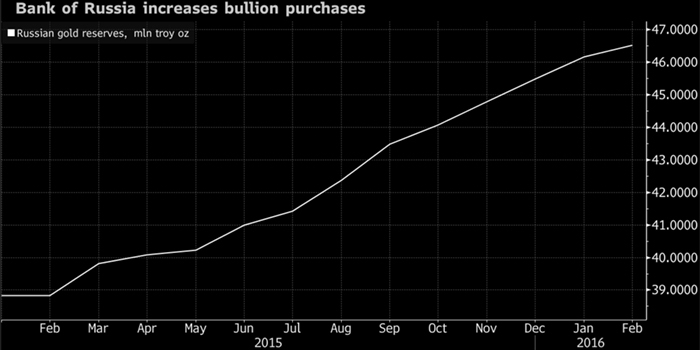 It is perhaps telling that the desire to expand operations coincides with declines in gold production. Figures sourced from the CGA (China Gold Association) indicate a 2015 production decline of approximately half a percent to 450 tonnes in China. Despite the fact that the production decline was small, the fact that it is no longer growing is significant given that the last decade has seen China’s gold output grow at an average of approximately 11% annually putting it significantly ahead of Australia, Russia and the USA as the world’s next three largest gold producing countries. Conversely, the same period of time saw Chinese gold demand increase by nearly 4% year-on-year; a figure that is wildly considered to be under-reported. That said, the globalisation of China’s gold production provides yet more evidence that the relentless search for gold acquisition at all levels is an undeniable modern reality. Regular readers will already be aware of gold’s impressive performance this year but we have often written about the concept of looking beyond price performance alone in order to grasp an all-important big picture when investing. 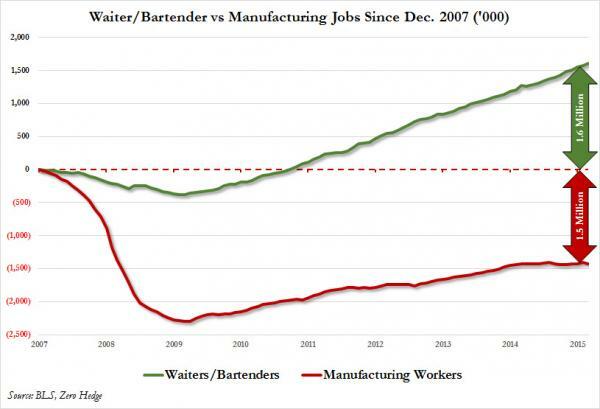 Few charts paint a clearer picture in this regard than the one below. 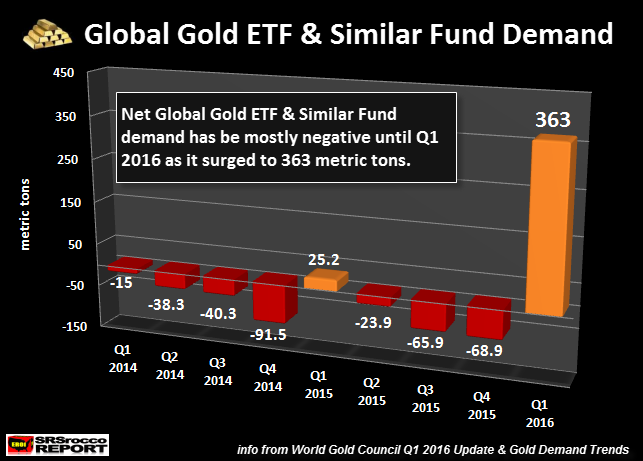 With the exception of a small circa 25 tonne accumulation in Q1 2015, the last few years have seen a loss of metal from mainstream exchange traded funds (ETFs) and related investment funds dealing with gold. This year to date however has seen a staggering reversal of that behaviour with something in the order of a 363 tonne accumulation into these funds. Let’s look at the context of this. This accumulation is the second highest quarterly number on record. The highest was recorded in 2009 as the GFC was devastating markets and investors sought safety in precious metals exposure. That period of time saw a 465 tonne accumulation. This current and sudden spike in metal demand however has happened amidst a backdrop of a Dow Jones level that was within 15% or so of its high. One could be forgiven for conservatively concluding then that the smart money is seeing some instability in current market pricing. For a broader context, we can reiterate that central banks have for some time reversed the direction of their precious metal movements. Once sellers, they are now strong accumulators as we often report. The following chart allows this to be easily visualised. 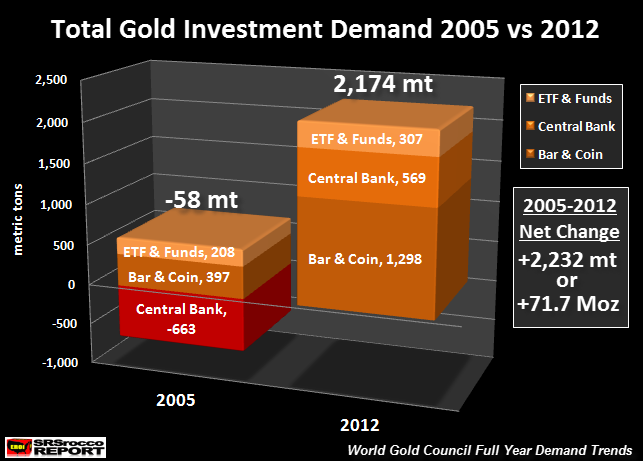 For the period of time between 2005 and 2012 we can observe a distinct change in policy regarding global central bank holdings of precious metals from an outflow of 663 tonnes to an inflow of 569 tonnes. ETFs and related funds along with bar and coin demand remained positive but increased in magnitude from 208 tonnes to 307 tonnes and from 397 tonnes to an impressive 1,298 tonnes respectively. The time period above spans the GFC and amounts to a positive net change of around 2,232 tonnes. Relating that to our earlier graph makes for sombre discussion if the numbers are indicating similar trends unfolding today in the ETF market. As always, the key to dealing with such uncertainty is diversity of assets. Mike Maloney released yesterday some interesting analysis of this week's Federal Reserve activity and is hypothesising that something ominous may be occurring behind closed doors. On Monday of this week, the Federal Reserve Board of Governors held an impromptu meeting using expedited (some use the vernacular "emergency") procedures. The purpose was to discuss monetary policy. Thereafter, Chairwoman Yellen visited the President at the White House for another irregular meeting. Interestingly, both meetings were closed door in nature and passed largely under the mainstream media radar. A google search of the Yellen-Obama meeting produces many largely identical articles containing what Mike refers to as "fluff"; meaning simply that they lack substances and convey only the simple idea that the two discussed the economy. What the White House meeting overshadowed was the actual Federal Reserve Board of Governors meeting on the 11th, held under expedited procedures as indicated on the Fed's website above. The purpose of that meeting was stipulated as being to review and determine advance and discount rates to be charged by the Federal Reserve Banks – or in other words, set monetary policy. The press always reports on these meetings. As indicated on the Federal Reserve's website, this meeting was scheduled last Thursday, April 7th. Again however, an attempt to google this board meeting largely produces results about the White House meeting. Googling "Fed Governor Meeting" produces largely results about the April 6th Federal Reserve Board of Governors meeting and notably, more information about the White House meeting again. As a consequence, we do not know what was said at these meetings – in particular the board meeting of the 11th. One thing that is known however is that the invocation of "expedited procedures" is unusual. Moving over to the White House website one can find a one paragraph press release pictured below. 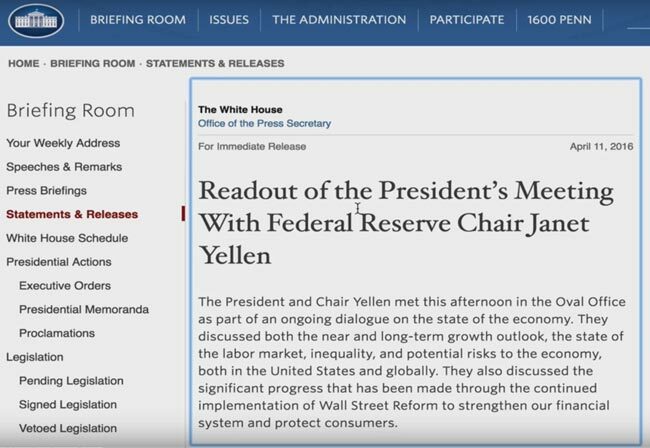 The release generically describes the Yellen-Obama meeting to be about "near and long-term growth outlook, the state of the labour market, inequality and potential risks to the economy" which seems to be the only information that the press has reported on. Over at the Federal Reserve website again, we see the list of recent meetings pictured below which includes the April 11th meeting. What's interesting is the fact that meetings are also scheduled for the 12th and 13th (today our time). This totals four meetings before reaching the half way point in the month which would imply a rate of eight meetings or more for this month; something that is highly unusual. Going back to January of 2015 there has been no precedence for this number of monthly meetings. Mike's hypothesis is that the lack of media reporting, the large number of board meetings scheduled, the fact that the White House meeting has seemingly "hidden" at least one board meeting in terms of reporting and the fact that the only substance being provided is "fluff" from the White House press release page all points to the conclusion that something irregular is being discussed behind closed doors. Using the response to the Great Recession as an example, Mike suggests that reactions to crises are often determined in secret and announced later; a tendency that could be seen to fit the pattern of behaviour being observed this week. It should be noted that Mike is not alone in observing this. An alert raised a few hours ago by Gregory Mannarino who we've quoted before has labelled this meeting behaviour as "unprecedented" and "emergency" in nature. He also observes the fact that the media is apparently under-reporting. The headlines will be interesting to observe as the week progresses.